"You all complied with my wishes and didn't bring guns..."
In the really competitive professions, such as journalism, humanity's most revealing foibles frequently emerge in ruthlessly large doses. In the high stakes pay-off of exclusively owning the "Big Story", some reporters will do almost anything, even steal and manufacture information--as we've seen in recent scandals. Mr. Tim Reiterman, famed author of the seminal People's Temple book "Raven", was an Examiner reporter who nearly lost his life down at Jonestown--and no doubt scores kudos for his courage there. There's just one little problem with our intrepid Mister R: Like Field Marshall Kilduff (who STILL has visions of grandeur concerning the "first expose" of Jones)--he got a permanent case of Glory Hunger. And with this unfortunate disorder, Reiterman created his own very, very dishonest versions about the actual first exposes that would have obliterated Jones, had his own gutless excuse for a newspaper just stood up to the plate and STAYED THERE. Reiterman's "Raven" is definitely a good read. Most of it actually sticks to the facts, too--except, however, when you arrive at around page 211. That's when the manure hits the turbo jets. Reiterman makes an incredible claim about my father, alleging that his "investigation" (Reiterman's quotes) was partially based on a personal grievance against the by-now clearly fraudulent and dangerous cult leader, Jim Jones. Keep holding your nose. He's got a few shovel loads more. Reiterman further maintains the exposes, that featured eyewitness and sworn testimony, "were not well substantiated." Yes, some reporters will do anything to own the Big Story, it seems. But he is not alone, as we'll see. Presented here is part two of more of the "unsubstantiated" story that would have brought down Jim Jones six years before the slaughter, had it only not been for journalistic cowardice. "I know that Pastor Jim Jones is God Almighty himself!" cried one of the more than 1000 people who overflowed the auditorium of Benjamin Franklin Junior High School on Geary Boulevard yesterday morning and Saturday night. "You say I am God Almighty?" asked the Rev. Mr. Jones, the charismatic pastor-prophet of the People's Temple Christian (Disciples) Church near Ukiah, who was holding special services in San Francisco this weekend. "Yes, you are!" shrieked the unidentified but obviously ecstatic woman, as the audience clapped or waved their arms and shouted approval at Sunday services. The Rev. Mr. Jones has been consistently attracting congregations of more than 1000 people - who travel by the fleet of ex-Greyhound buses from as far away as Los Angeles and Seattle to his home in Redwood Valley, seven miles north of Ukiah, and to services such as those this weekend in San Francisco. Among those attracted is the assistant district attorney of Mendocino County, Timothy O. Stoen, who has affirmed in writing that the Rev. Mr. Jones has raised 40 people from the dead. Jones arrived in California in 1965, accompanied by 165 of his parishioners from the People's Temple of Indianapolis, where he served as pastor. He is a darkly handsome, 41 year old, part-Cherokee who is an ordained minister of 1.9 million member the Disciples of Christ (Christian) Church. Yesterday as he conducted services, he was clad in a white turtleneck sweater, a pulpit gown, and dark glasses. He was seated on a cushion-covered stool behind the podium - which is an apparent necessity given the five and six-hour length of his services. "What do you mean by that? If you believe I am a son of God in that I am filled with love, I can accept that. I won't knock what works for you - but I don't want to be interpreted as the creator of the universe." "If you say 'He is God,' some people will think you are nuts. They can't relate. I'm glad you were healed, but I'm really only a messenger of God....I have a paranormal ability in healing." The Rev. Mr. Jones had just completed what were said to be two resuscitations of parishioners who had either fainted or gone into catatonic stiffenings in the general excitement. In each case, he stopped in the middle of a sentence, raced from the stage to the audience and laid hands upon the stiffened congregant. After some 30 seconds, the audible tension of the multitude broke as the Prophet lifted up each prostrate figure - to thunderous applause. Another unidentified woman began leaping wildly and screeching hallelujahs - while an even more elderly woman commenced a frenzied hopping in a corner down stage right. "You'll have to understand - she was given up to die; they said she'd never be able to move again....Such experiences are not at all uncommon to us. That's the 43rd time this has happened. I just said: 'I love you, God loves you, come back to us.' The registered nurses around her said it was so." These R.N.s were neither introduced nor even identified, however. They were hardly even apparent, given the number of large men who surrounded the reported resurrection. None of these security guards ("ushers") was spotted carrying firearms, however - in contrast to last Sunday's service in Redwood Valley, where an Examiner photographer spotted three holstered pistols (one a .357 magnum) and a shotgun. "You all complied with my wishes and didn't bring guns, even though you are afraid for me," congratulated the Rev. Mr. Jones. Yesterday morning's services opened with two hymns, followed by glowing testimonials from 3 men who recalled how The Prophet had either healed them or in one case saved them from air crash and false arrest for transporting narcotics. Then The Prophet made everyone hold hands (after an initial embrace). With the organ providing a tremolo background, he began a series of trance-like revelations about various people's names, relatives, addresses, and maladies. These assorted ills were all pronounced cured by both healed and healer - to further applause. Among a vast number of subjects discussed by the Rev. Mr. Jones in his two-hour extemporaneous sermon was the desirability of cooperation and fellowship with other denominations. He did note in this connection that this is sometimes difficult, however. "We tried to fellowship with one pastor in this area - who actually propositioned two of our young choirgirls! And when I confronted him about this, he replied: "Wasn't David a man after God's heart?" But this San Francisco pastor was not identified by the Rev. Mr. Jones. Nor were several assistants and parishioners able to identify the man. The prophet's offertory calls are (comparatively) low key. He told the mammoth congregation that the elders had informed him that Saturday evening's collection was "light." Later in yesterday's service he applied this very same (unspecific) description to the Sunday's collection - while one week ago, the Rev. Mr. Jones described the current financial condition of the People's temple as "bleak." Postscript: To Reiterman's credit, the "truth" section of his book was refreshing, citing the fact that after my father's exposes, "....the Examiner quit the story. A nobody named Jim Jones had worn down a big San Francisco daily......Meanwhile, the Temple set sights on Kinsolving as a declared enemy. At one strategy session, an overzealous church leader suggested that he be kidnapped, stuffed in a bag, then beaten or 'eliminated'." Though never eliminated, his house--my house--was burglarized by Temple members. [caption] "REV. 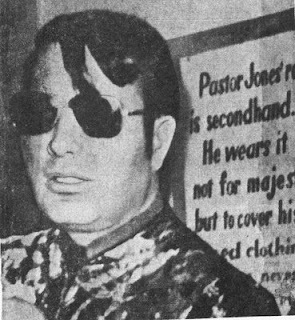 JIM JONES, THE PROPHET--ONE WOMAN SAID HE IS GOD ALMIGHTY"
This is the photograph of the cult monstrosity that greeted the world on the front page of the San Francisco Examiner in September, 1972, on the second day of my father's series of exposés which lit up a bonfire of dire warnings, all ignored then, with tragic results. The establishment has dismissed or outright erased the record--up until today. most glaring examples of this syndrome of self-serving media misinformation. Now, for the first time in almost 35 years, read what the people of California found out that Sunday morning about a crazed wolf in clerical garb. Read through with this thought: Six long years lay ahead to rescue those people from the slaughter in the jungle. Think of the foster children illegally taken, tortured, and murdered, while officials such as San Francisco politician Willie Brown praised, cheered, and supported -- all the way to the massacre -- the Stalinist beast Jones. The other seven exposes will make your hair static electric with outrage, enough that you should pick up your cell phone, call the local PBS station, and demand to know why they are broadcasting Stanley Nelson's cult apologist propaganda film, "Jonestown: Life and Death of People's Temple." 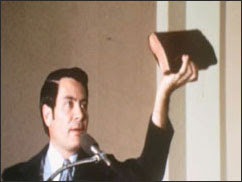 May these once "buried" exposes by a courageous reporter--who Jim Jones and his Temple Enforcer Tim Stoen plotted to murder--finally provide the complete, genuine history of the People's Temple cult, at long last. REDWOOD VALLEY ---- A man they call The Prophet is attracting extraordinary crowds from extraordinary distances to his People’s Temple Christian (Disciples) Church in this Mendocino County hamlet. His followers say he can raise the dead. The PTC (D) Church’s mimeographed newsletter recently described the resurrection of a Los Angeles man. His congregations, mostly black, believe The Prophet possesses other, equally amazing powers. They come from all over the West—from as far away as San Francisco, Seattle and Los Angeles — to the Temple, 7 miles north of Ukiah. The weekend flock is gathered by the Temple’s fleet of 11 ex-Greyhound buses for services that often run from 11 in the morning until 11 at night, broken only for communal meals prepared by Temple cooks. Congregations number over a thousand and attendance at weekly services is similarly impressive. The Prophet (or Prophet of God, as he prefers to call himself) is the Rev. Jim Jones, 41, the part-Cherokee former pastor of the People’s Temple Christian Church in Indianapolis. So powerful was the appeal of The Prophet’s ministry reportedly designed to create a Utopian community along the lines of the early Christian church that when he decided to move west seven years ago, a goodly number of his Indianapolis congregation came along. No less than 165 Indianapolis Temple-ites—including several teenagers—moved to Redwood Valley with the Rev. Mr. Jones in 1965. The Temple’s total participating memberships today is 4,711, according to one of its directors. “Grand total income” is said to have been $396,000 for the year ending June 30, 1972, while “grand total paid out” is put at $343,000. Permanent funds: $260,000. The resurrection cited in the Temple newsletter transpired inside an ex-Christian Science Church building in Los Angeles—-the latest in a series of PTC (D) Church real estate transactions. And the Temple is presently in final stages of acquiring an auditorium to house the proposed San Francisco People’s Temple—just across Geary Boulevard from the Japanese Trade Center. The Rev. Mr. Jones’s influence in the Ukiah area is apparently just as strong as his impact on the congregations who jam his temple (with its 41-foot indoor swimming pool) to overflowing. Not only is The Prophet a part-time teacher in the local school system, he has also served as foreman of the Mendocino County Grand Jury. 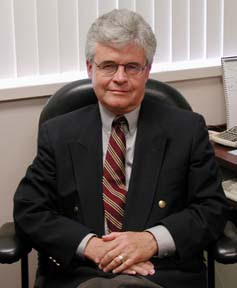 He has certainly won over the assistant prosecuting attorney of Mendocino County, Timothy O. Stoen-—who is one of the Rev. Mr. Jones’s five assistants, a member of the Temple’s board of directors—-the man who claims “over 40” resurrections for The Prophet. It pledged that “you are not only welcome in this valley but are highly respected"—and was signed by nearly 200 residents. But the harassment did not abate. For this reason, The Prophet travels with impressively armed body guards. Attendants at services wear pistols in their gun belts. There is little question of The Prophet’s influence on the Ukiah Daily Journal—for when The Examiner inquired about the People’s Temple and its charismatic pastor some months ago, Journal editor George Hunter immediately reported the inquiry to the office of prosecuting attorney. “I have seen Jim revive people stiff as a board, tongues hanging out, eyes set, skin graying, and all vital signs absent. Don’t ask me how it happens. It just does. “Jim will go up to such a person and say something like, ‘I love you’ or ‘I need you’ and immediately the vital signs reappear. He feels such a person can feel love in his subconscious even after dying. Stoen’s written affirmation of the self-effacement of The Prophet did not include any explanation for the three tables just outside the main entrance of the People’s Temple. These tables are loaded with either photographs, or neck pieces and lockets—all bearing the image of the Rev. Mr. Jones, and on sale at prices running from $1.50 to $6.00. The Prophet, as Stoen describes him, is "supremely and totally dedicated to building an ideal society where mankind is united, life (human and animal and plant) is cherished, and the joys of nature and simplicity are esteemed." Meanwhile, his sturdy sentries lend the temporal assurance that the Temple of The Prophet is the best-armed house of God in the land. As promised, Jonestown Media Manure Meal #1 comes from the San Francisco Chronicle's Michael Taylor in a special 20th Anniversary "retrospective," on Nov. 12, 1998.
called himself the Prophet and claimed to be raising the dead," writes Taylor. "But ensuing official investigations of Jones went nowhere." By the time we get to the end of this series, let's hope Taylor and his fellow fourth estate knaves will still have at least one nostril above the suds in the Sewer of Lying By Omission. Check these two dates on your calendar, everyone—this is one of those “good news/bad news” announcements. The Good: Tuesday, March 20. The Bad: Monday, April 9. A second wave of toxic fallout will be Nelson’s hawking the DVD to anyone that wants “to arrange for an educational screening in your community…” One can only imagine how much more snake oil he and writer/wife Marcia Smith have packed into their perverse meal-on-wheels for every community, everywhere, anytime. Something of a scourge, modern-day Biblical proportions perhaps? Lord Nelson's revisionist ooze is about to flood family rooms across the nation. The good news: There’s still time to inoculate your brain—from the radioactive wash.
Alluring it may be, Nelson’s Swiss-cheese version of People’s Temple doesn’t require anything more than a basic historic reality check. This thing is a triumph of style over substance, ridiculously riddled with holes of credibility, continuity, and candor. That’s why it’s important to be ready two days from now, on Tuesday. Appearing here will be a series of 1972 San Francisco Examiner exposes by my father — this one called “The Prophet Who Raises The Dead”. One by one, you will finally see how Jim Jones’s criminal enterprise was being uncovered. 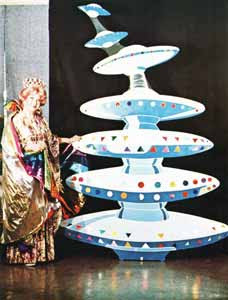 It started, actually, with a story in the Indianapolis Star, the year earlier. So much time before the 1977 New West expose. So much time to have been able to rescue all those men, women, children, the toddlers, and the babies, from their years of cult captivity. And from being shipped off to a Guyana Gulag to be slaughtered like cattle. The massive, collective denial about this must stop, once and for all. How much longer can virtually all the media, politicians, clergy (especially the Rev. John V. Moore), or anyone else connected with this story continue with the charade? For “documentarian” Nelson, however, it's not enough just to participate in this grand delusion; he takes it up a notch with bizarre notions of a destructive cult's "fulfilled promises." Telling a story in this fashion, with much “assistance” from Becky Moore and Mac McGhee's “Jonestown Institute,” is lying by omission. According to Nelson and his “New Religious Movement” mentors, the People’s Temple cult, which subjected its members to extortion, beatings, cattle prods, malnutrition, sleep deprivation, and other tortures, actually were “sharing a lot of love” and “equality” in those times. These exposes showed otherwise, all the way back in 1972. If our then-media editors, and the so-called crusading reporters like Marshall "Pursued 'Em Early & Often" Kilduff, Tim Reiterman, and others had just had the wits and the guts in 1972 to join forces with my father and Indianapolis Star reporter Carolyn Pickering in their fight to stop Jones in 1972, THERE WOULD NOT HAVE BEEN A JONESTOWN. But the Boys on the Bus just reclined and snoozed through 1972, and '73, and '74, and the other years, peaking out their windows as the Temple Train rolled towards the jungle cliff. That, along with our news pundits' catchy little "....drink the Kool-Aide" phrase, seems to keep our current Fourth Estate elites unbothered about such trifling little past boo-boos. This Tuesday, the light switches back on. Follow it, in spite of that thick fog billowing all around you in this once sacred, self-serving Jonestown Fable Forest. This is the final preface to the series of eight shocking San Francisco Examiner exposes by my father that, had they been allowed to run in their entirety, would have blasted charlatan Jim Jones out of business. But those miserable Examiner editors, and the rest of the pathetic regional media, didn't have the backbone, so frightened by law suits from Peoples Temple enforcer Tim Stoen (who today they JUST don't care to mention, you'll notice). And so, THEY DID NOTHING. After running only four articles in September 17-20, 1972, and getting picketed by Temple cultists, the Examiner went into a fetal position and surrendered, for almost the next five years. The sordid details of that scandal have been efficiently covered up until now, by the Examiner and the usual suspects, Tim Reiterman and Marshal Kilduff, who shamelessly attempt little fairy tale rewrites of this into a minor footnote. If, on the other hand, you'll be watching for the first--or perhaps the second time--the History Channel's "Jonestown: Paradise Lost" docudrama tomorrow night, abandon any hope of having the record set straight there. The same goes for it's accompanying documentary on cults, in "Decoding the Past," which while a superb expose as a whole that puts cult apologists (NRM) on the run, still inexcusably neglects Top Jones Aide Stoen, who was the Co-Engineer of this cult nightmare until finally defecting close to the end. The "Decoding" producers decide instead to allow Kilduff run his twisted little spin on it throughout. One of the other questions that people should ask directors Nelson and Wolochatiuk is WHY they squelched the story of the crisis over John Stoen, the little boy claimed to be fathered by both Jones and Stoen? What made this so compelling is that it nearly precipitated the mass killing over a year earlier-- "The September, 1977 Crisis." All this, clearly explained in Debbie Layton's famous affidavit given to the U.S. State Department, now part of the historical record, now a part of the history that is standard to anyone versed in Jonestown history. I understand Nelson censoring it, because he has an apologist agenda to follow. It's easy for him to delude a universe of theatre goers and bloggers with his cinematic sleight of hand. But Tim Wolochatiuk? The Producers of "Decoding History?" “…..Would it interest you to know that your main punching bag these days cooperated as much with ‘Paradise Lost’ as we did with Stanley’s film? Check the closing credits, next time it comes round on your TV. At least, however, "Paradise Lost" didn't offer up some grotesque apologist tripe about Jonestown, like the kind you see on these "NRM" websites. Lamentably, however, it did miss the mark, like all the others. But no mind. Now you'll have a chance to "read all about it,"
In this editorial by the Times Standard, they focus on Tim Stoen and his published apology to my father, which first ran in the Santa Rosa Press Democrat (to be posted.) Interesting thing: The Examiner just didn't have any room for such a story! And, like Orwell's Big Brother hard at work on "fixing history," our "Jonestown" director, Stanley Nelson, too, just didn't have any room for such a story.... Coincidence?? Somebody needs to call Stan, or Mrs. Nelson (his writer, Marcia Smith) and ask them why, don't you think? "After three decades, Assistant District Attorney Tim Stoen wrote a letter of apology to the reporter whose life he helped make miserable in the early 1970s for stories written on the strangely violent and pseudo-messianic happenings at the People's Temple under Jim Jones. Stoen, as is well known, was a top aide to Jones until about a year before the cult's infamous mass suicide. Before his break with the temple, he and other Jones supporters publicly flayed the reporter and protested the offices of the San Francisco Examiner for his unpopular accounts of the goings-on at the People's Temple. While perhaps startling, the letter was a thoughtful gesture from Stoen to reporter Les Kinsolving, who had recently suffered a heart attack; Kinsolving released the letter to the press. Meant as a private communication, it seemed heartfelt and expressed a level of regret that Stoen hadn't said publicly over his involvement with the People's Temple. That made it newsworthy to the Santa Rosa Press Democrat, and to this newspaper as well. But Stoen said he felt the Press Democrat reporter who wrote the story made too much out of something that Stoen said has been consistent all along: he has repented and apologized for his actions with the People's Temple and Jim Jones. Stoen may not realize that in the letter he admits more wrongdoing than he has in the past; for the second-highest-ranking law enforcement officer in Humboldt County, that by itself makes it a big deal. Remembering that more than 900 people died as the end result of Jones' ministry makes the letter's importance even more clear. Since he became right-hand man to DA Paul Gallegos, Stoen has blazed a maverick and sometimes unusual trail of his own, including an odd three-day Senate campaign run and a personal style that has put him at odds with some in the local legal community. Be that as it may: We applaud Stoen for writing the letter and for making the admissions he did -- it seems to show a mature man making a thoughtful amends for past bad judgments. We hope the lessons expressed in the letter will not go unlearned: The media can still function as a safeguard for society. If Bay Area powers-that-be and other journalists at the time had listened to Les Kinsolving's reports about Jones and his temple, maybe those 900-plus lives could have been saved." Surely could have. But weren't. The politicians, clergy, journalists, and others that aided and abetted Jones aren't yet ready to admit to this, or their role. The public needs to confront them. Call Cecil Williams. Send e-mails to Willie AND Jerry Brown and all the rest. Ask them WHY?? And San Diego Union-Tribune reporter Sandi Dolbee, who is assigned to cover the "religion and ethics" beat, just missed all that. She did, however, do a splendid job of whitewashing the 25th Anniversary of Jonestown, when she provided Becky Moore a Cult Apologist Sermon in her story. Moreover, at this CESNUR conference, Dolbee gave all these "scholars" free reign to cheer on the extravaganza's opening film, which was, but of course: Nelson's "Jonestown." With this kind of "ethical" coverage, it makes one wonder if perhaps its time to move Dolbee to a different beat. Has she become "one of them"?? Uncanny how Nelson was so hardpressed to find ANYONE with a contrasting view, say, that had experience with the cult in its "glory days" in Redwood valley, when they were happily picking crops, and singing, hugging, laughing, and "sharing lots of love," according to our director. He could have interviewed Norman Clow, now living in Houston, who lived in Redwood Valley at the time and attended school with some of these cult captives. Norman wrote to me, shortly after reading the Stoen apology story over the Associated Press wire (made the AP, so the story went as far as Australia, ladies and gentlemen--yet, still NO ROOM FOR IT IN EITHER OF THOSE SPINELESS SAN FRANCISCO NEWSPAPERS....). "Jim Jones taught in our schools in Anderson Valley in the 60's (Boonville, west of Ukiah/Redwood Valley) and in fall 1967 he brought a dozen or so Temple students to our high school. Three were in my senior class and two of them died (Anita Ijames and Judy Stahl-Ijames). One, Faith Worley-Kice, left before the move. 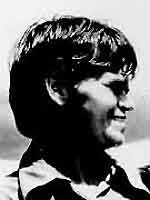 Dale Parks, who was one of the defectors during Ryan's visit and whose mother was killed at the airstrip was a friend for that year. We were good friends, as much as possible under the circumstances. I saw Dale in Ukiah a year later and he was "recovering". I met his dad, who I don't believe ever would. Ava Cobb was another great friend. Her brother Jim, who I knew, was one of the ones pushing for the investigation. I always understood that she had left the movement with her brother but recently saw her name and a picture - could have been here - in a list of those who died. I know many of her family members did die there. I hope she didn't. They were all good kids, fun to be around even given their unhappiness over the Temple, and none of them deserved any of it. I believe Jones was a madman practically from the day he was born. Many of us kids at the school thought the guy was a little wierd and maybe even dangerous in the 60's, but no one would listen, certainly not the school authorities. You could tell the students he brought to the school were very uneasy, just always intimating some fear or regrets about their situation. But you couldn't get past a certain point with them - they still deferred to that loyalty he had built in them, called him Father, and there was an invisible wall that kept you always a certain unassailable length away. Of course you realize Tim Stoen went back to Mendocino County as an assistant DA and is now in that capacity in Eureka, Humboldt County. He has publicly apologized several times for his involvement, recently admitting it was a terrible mistake and asking forgiveness. Fine, but I'd still just as soon not have him as the local DA. As a lay pastor of the rare conservative stripe in the United Methodist Church, I often wonder what on earth was going on in the eyes of the various churches back then. Your dad was a very brave man to do what he did. Many of us knew he was right all along and we all owe him a debt of gratitude for the part he played in getting all of this out. Thank him for me." "THE PROPHET WHO RAISES THE DEAD"
There he was, smirking and bantering about the usual edifying subjects, such as tossing trash in movie theatres. It was more than a mild shock to see my favorite comedian, the sometimes "master of his domain" walk out on that stage at the Kodak Theatre to take charge of a very special nomination list on Hollywood's holy night. 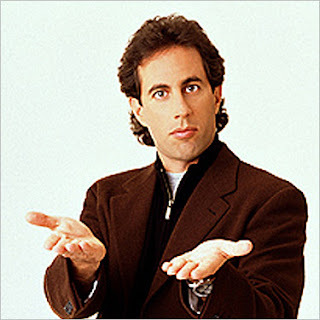 That list Jerry Seinfeld read at the Academy Awards on February 25 named the five nominated best documentaries of 2006, out of which, of course, "An Inconvenient Truth" got the Oscar. The ultimate winner was the Academy itself, and all of us. Unlike the Grand Army of the Obtuse that makes up nearly all of our film critics, Academy voters had the wisdom to give thumbs down to a piece of cult apologist cinema that's brought new meaning to the reckless disregard for another "inconvenient truth." In reality, a multitude of inconvenient truths are suppressed ruthlessly and repeatedly--in "Jonestown: The Life and Death of People's Temple"
Director Stanley Nelson's editing tricks in his "Jonestown: The Life and Death of People's Temple" easily sent nearly every movie critic swooning, yet another reminder about film's power over those ignorant of history. 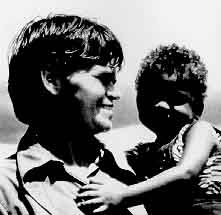 Nelson's film is a potent propaganda showcase, largely owing to its subject matter, of course. No questioning his craft, folks. This is one gunslinger that doesn't miss his mark: He fuses together enough of the "correct" film clips of the cult; enough of the "correct" heart-wrenching, toe-tapping music; and enough of the "correct" interviews rigged to paint a portrait of a cult that was, as one interviewee claims, "vibrant" right up to the day before mass-murder in Jonestown. "Vibrant?" So the forced labor, malnutrition, and torture (which started in California, protected by the media), was secondary. "Vibrant" isn't the only superlative our "documentarian" has cherry picked from carefully screened interviewees in redecorating what social psychologists have concluded as one of history's most destructive cults. In Nelson's 90-minute window dressing, this group of brainwashed people that burned little children with cattle prods -- for years, in California, while the "crusading media" did nothing-- has a whole lot more than "vibrant" attached to it. Here are some of Nelson's sweetened-up interview samplings: „"..People's Temple truly had the potential to be something big - something powerful" "As soon as I walked in (the Temple), I was home""...Every single person felt like they had a role there." Everyone felt like they were exceptionally special..." "There were many reasons to love, admire, overlook, and excuse the things Jim did." Yes. Of course. While a gang of your frenzied fellow cultists are electro-shocking your five year-old for being "naughty, you just keep countin' ALL the heart-wrenching reasons to admire the great social activist, "Father" Jones. Not a big problem, though, since this perverted version of a rainbow coalition mutated out of the deadly efficient mind control and terror tactics employed by Jones', with an always helpful little nudge from those Temple "Angels of Death" (his gun-toting enforcers). Nelson, however, doesn't see the need to go through the motions of excusing such inconvenient truths. For instance, his documentary remarkably covers up ANY MENTION WHATSOEVER of the horrendous children's torture feature, "Blue Eyed Monster," practiced by the People's Temple, in the California years, which he instead has papered over in some of the most disgraceful, dishonest film making on record. Card stacking refers to the method of intentionally deceiving people so that they will support a cause or ideal in which the propagandist strongly believes or from which he or she will realize financial gain. The term originated from the magician's gimmick of "Stacking the deck," which involves presenting a deck of cards that appears to have been randomly-shuffled but which is, in fact, in a pre-conceived and logical order. The magician knows the order and is able to predict or control the outcome of the trick; the audience is unaware of the gimmick. In poker a deck can be 'stacked' so certain hands are dealt to certain players. Card stacking is full of half-truths, outright lies, omissions, and distortions. Of course, Stan's in this mainly to score points as the genius film maker he is, on behalf of what he's digested from his meals at Becky Moore and Mac McGehee Jonestown Institute Inn. They happily held his hand and guided him in finding the "right" info and interviewees, and, yes, would include token citations of those unsavory sides of the cult, but in "just the right measure." Take the interview of the married male cult member who related the time a young male made an announcement regarding "Father" Jones' sexual predations on the other men. Nelson finishes the scene with the interviewee laughing and making light of it. Another interview, a cult member recounts one of the cult's physical tortures carried out, "the boxing punishment." He told about throwing water on someone he had beaten unconscious, and then being forced to beat him further. He then related how "tiring" it was having to fight five people in one night. Once again, like the sexual predation scene, Nelson films the cult member laughing over this horrifying ordeal. Once again; is this something a responsible director edits into making light of? Minimize--the facts (and these are just a bare few of the unsavory that are disclosed) of a boxing torture and Jones sexually preying on males? On the other hand, the "positives" are hand-dipped in super-sweet seductive coating. You only have to see the film's trailer on Nelson's website, showing that staged clip of smiling, hugging, laughing, happy Temple folks to realize something is amiss. That is, unless you have some notion that destructive cults deserve a second look. It is safe to say that you (a) were too young too recall the People's Temple, (b) are a fanatic in the "New Religious Movements," or (c) should do some homework. 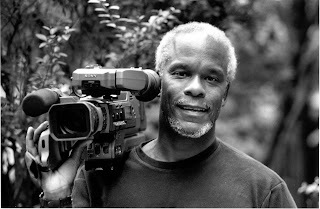 While Stan boasted openly about making "somewhat objective" documentaries this year to the New York Times, he and wife/writer Marcia Smith's credibility was called into question three years ago for another of their films, "Beyond Brown: Pursuing the Promise," in a May, 2004 Washington Post Live Online program. A caller from Austin, Texas had caught them ˜playing fast and loose with history..." "I honor and understand the meaning of Brown vs. Topeka board of Education," said the unnamed caller, "However, I do not understand the glossing over of facts to sell the story." In a November, 2006 KQED (San Francisco) Radio interview, Nelson trumpeted for the umpteenth time the Big Lie that he has so cleverly mesmerized much of the public with in his film. People's Temple, you ask? "They delivered on their promise," said Stan, of the cult that practiced forced labor, death threats, malnutrition, extortion, child abuse, torture, all occurring in California. "They shared a lot of love," said Stan. Media knuckle-heads like Pittsburgh Post-Gazette critic Barry Paris are enchanted by the Temple "delivery," with enough superlatives to get Jonestown Apologists CEOs Becky Moore and Mac McGhee worked up into a fever-pitch Irish jig just in time for upcoming St. Patty's Day. "Jones, after all, was a bona-fide civil rights pioneer..." gushed Paris, "...He built a congregation that promised food, clothing, shelter and retirement homes to its people and delivered. Sure, folks had to give a 20-percent tithe (which evolved into giving all their money and possessions) to the church, but that wasn't so unusual and they did it voluntarily. In the utopian-community, a deal's a deal." "A deal's a deal." That's right. And like the rest of our witless media "pundits," Paris is completely enamored by the Nelson's "revolutionary" film making process, and just can't be bothered with the possibility of any missing pieces. I wonder if Paris, for example, has ever even heard of Father Divine. Or does he even give a damn about it. Nelson surely has. In fact, his wife Marcia mentioned Divine at the world premiere of their film, way back in January, 2006, in Salt Lake City, Utah, when they gathered with, oh, that's right, Becky Moore of all people! Salt Lake City, of all places, too. Home base of the Mormon Church. Not that this would be construed as some strategy to "snuggle up" our hard-working cult apologists (NRM's) with an established church, oh, Lord no. 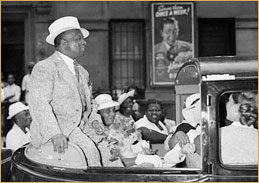 "A turning point in JJ‚s career was his meeting with Father Divine, the legendary black pastor from Philadelphia," writes Maurice Brinton, author of "Suicide For Socialism." "Jones was vastly impressed both by his spell-binding preaching techniques and by the total control he still exerted on his congregation (which consisted mainly of elderly black women). From Divine, Jones learned all about "organizing congregations‚" about how to use an "Interrogation Committee‚" He saw the Committee as the logical extension of his grip on his flock." In Indianapolis, Jones started to surround himself with a group of "totally loyal‚" men and women, black and white. They would watch and report to Jones on the other parishioners. This was probably the first instance in history of a totally integrated, "non-racist‚" Secret Police. Thomas Dixon, one of the early members of the Temple, broke with JJ on this issue. "The Committee‚" he said, "was primarily to deal with those who disagreed with Jones. Whoever was summoned by the Committee was grilled for hours on end with questions such as "Why are you against the Reverend?" Integration, especially pre-Civil Rights era, was a bold, brave act, absolutely. But AT THIS COST? This, in essence, is the utter disgrace of Nelson's film - his deliberate cover up of Father Divine's critical impact on Jones and Jones's totalitarian savagery that began percolating all the way back to the Indianapolis years and grew exponentially as the cult drifted to California, and to its final tragic end in Guyana. But our stunningly astute in Pennsylvania critic swallowed Stan's Subterfuge like a four-year old would gobble down a bowl of sugar pops. "Watching footage of Jones‚ congregants building their church and homes and tilling the soil in their communal farm in Guyana," wrote Paris of Pittsburg, "we see that most of them are clearly quite happy. 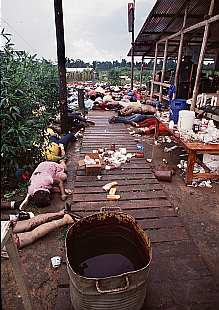 The irony is that, in many ways, Jonestown was succeeding, not failing and Jones had done an impressive job of carving out a self-sufficient collective community there." Clearly quite happy?? As, say, the Jonestown children being repeatedly dunked at the bottom of community well (Jonestown's "Big Foot" attraction), screaming over and over in the middle of the night for a mommy or daddy to rescue them. But who never arrived, thanks to the "impressive" effects of being drugged, beaten, starved, brainwashed, and forced back by gunmen. The reality of course was that Mr. Green Jeans Jones' little ol' "communal farm" (thank you, "Jonestown Institute" Bank of Depraved Euphemisms) was nothing more than a gulag. Nice work Stan--Paris is convinced he was looking at scenes from Disney's Frontierland. Perhaps Paris Hilton could give a more reliable assessment the next time. "How To Write History: Research and Representation in the Historical Documentary." Okay, so we all now know the folks at UC-Santa Cruz have a good sense of humor. Twisted, but rousing. In another, more serious milieu, a Nelson-attended conference might better be titled "How to Write Sophistry: Faulty Research and Card-stacking Technique in a Historical Documentary." What is vitally important is that students and visitors not give the Nelsons a free ride, like the critics have. Get out there and grill them with questions, people! Why did he leave out the role of Tim Stoen, Jim Jones's top enforcer? Without Stoen's legal terror tactics, exposes long before 1977 would have been published that would have put the cult out of business. Stoen later lied publicly, long after Jonestown, about having been in Jones's "inner circle," in a self-serving ploy to get his old job back in the Mendocino District Attorney's Office. Nelson, predictably, will have some flimsy excuse for censoring Tim Stoen. Last summer when confronted by my father and me at a film screening, he claimed it was "another one of the stories that we wish we had been able to include." This is where Nelson jumps from disingenuous into Stoen's camp outright lying. I doubt there was even the slightest shred of desire to include Stoen. And that is yet another in this parade of countless outrages. Millions deliberately starved to death in the Ukrainian forced famine. But what if Nelson shows footage of families happily working in the fields. Millions are sent to forced labor camps. Nelson's footage shows dancing Russians, and kids getting free schools and medical care. Such lethal omissions about history can have devastating consequences on the future. You know what the saying is about not learning the lessons of history and its consequences--made famous on that forboding sign in that horrifying pavilion. Here's another hypothetical in a Nelson film on Stalin: Our "revolutionary" director decides to leave the audience almost completely in the dark about Leon Trotsky. Trotsky, who was Stalin's rival, later assassinated, might have succeeded in stopping the monster in his assent to power, had he been more astute politically and made certain Lenin's Testament had been read publicly. But Trotsky never did. 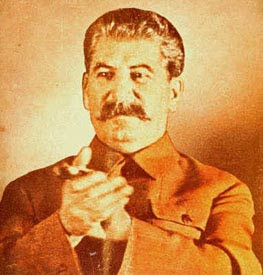 The Testament was censored in the USSR. And he, and millions of people, paid dearly for it. Still, Nelson decides, "Well, I just don't have room for Trotsky in this story, sorry about that....!" Responsible, accurate way to "write history"?? Some directors, it seems, are more than willing to leave out key facts as such, if it suits their "ideology agenda." You can love Michael Moore or hate 'em; his film "Fahrenheit 911" had a couple of scenes that stick out as some of the most appalling instances of this syndrome. The first scene has an American soldier in Iraq singing to a heavy metal song, "...let the motherf----- burn, burn motherf-----, burn..." The other shows, just prior to the U.S. invasion, Moore's POV (point of view - film jargon, that is) of Saddam's brutal regime: Kids are playing, a wedding, and people are laughing. No scenes of Saddam's torture chambers in the montage. This--a "documentary?" Oh, almost forgot. Nelson worked for Moore one time. But then, it would be unfair to pick on just poor ol' Stan. No, indeed. As said at the start, this People's Temple Rogue's Gallery is enormous. There are so, so many more to discuss and confront. So many that helped that Beast Jones, who they DEFENDED and PROMOTED SHAMELESSLY ...reporters, columnists, editors, talk show hosts, clergy, lawyers, state assemblymen..it is mind-boggling. Many of them have turned revisionists, like Nelson, and lie compulsively, like Nelson, in order to maintain their place in the limelight. Truly sickening. It's time to set the record straight. The next Jonestown Apologists Alert will premiere a special series of stories, exposes that you, the public, should and must read. The San Francisco Examiner, when it was still a "functioning" newspaper, published a three-part series back in November, 1998, on the 20th Anniversary of Jonestown. "The Examiner owes it to its readers ...to publish a series that goes far beyond a recollection of what happened. What we hope to do in these stories is raise and answer key questions that still haunt us all about Rev. Jim Jones and the tragedy that befell his followers˜and all San Franciscans˜two decades ago." But of course predictably what Bronstein, now at the S.F. Chronicle, then offered up was the same, tired old fabricated garbage the California media has continued spewing out non-stop for what is now close to 30 years. This heap of self-congratulatory drivel is designed to cover up their weakness, stupidity, and cowardice in not shutting down Jones and his Temple Mafia when they easily had the chance. Bronstein, you--and the rest--STILL OWE. When there was still time to do it. A time such as September, 1972, when my father, Les Kinsolving, was honing in on them like a Hellcat fighter in the Pacific. He had eight exposes set to run in the Examiner of the fraudulent, menacing cult. Four, however, never saw the light of day, thanks to Jones enforcer Tim Stoen (who later apologized for his actions, whose motives are still unclear). The first expose, "The Prophet Who Raises The Dead," ran on the front page of The Examiner, Sunday, Sept. 17, 1972. Those that have wanted it, or the other three, never published again, for their own self-serving, immoral reasons, will now no longer have their way. These, and the other four exposes that were originally censored under the threat of Jones and Stoen's law suits, will be published in their chilling entirety right here. Then you'll understand that one of the greatest crimes was simply that the Jonestown Massacre never needed to happen, only for the fact that the Examiner, and the rest of the California media lost their backbone in 1972--but will still not own up to it. And it's clear that our Cult Appologist film maker has thrown that one, as well, into his cinematic chamber of secrets. He's consistent, people. Stanley Nelson, in his KQED program, proclaimed that [not until 1977] "Marshall Kilduff rang the first alarm about People's Temple!" Tomorrow and Wednesday, when Nelson appears at UC Santa Cruz, and gives instructions on "How To Write History: Research and Representation in the Historical Documentary, " will he continue displaying the same level of candor?